Since the work appeared, the rural development challenges analyzed at length in the book, whether demographic, economic, environmental, social, cultural or political, seem even more difficult to contend with. Many Sub-Saharan countries, the Sahel in particular, have yet to begin their demographic transition. The agricultural economy, still largely dominated by small family farms, is hindered in achieving its full potential by the lack of interest demonstrated by weak public authorities and scattered aid agencies. Ecosystems are threatened more than ever by human actions and climate disturbances, social ties in rural areas are more likely to become strained than to be formed, and many young people have a hard time finding their place. The rural culture is slowly crumbling as a result of urban and international interference, and the spread of African-style democracy is hampered by the actions of power-grabbing cliques. In addition, numerous local tensions, growing numbers of highway thugs, gangs and ethnic conflicts and the rise of Islamist terrorism seriously compromise security in too many rural areas. Faced with this grim picture, it is important to recognize the strengths that could make overcoming challenges in the rural environment possible. First, from a technical standpoint, Africa is fortunate that it has not embraced chemical agriculture, as this affords it the opportunity to promote agro-ecological farming models, which certainly have their place in addressing climate change. Furthermore, the improvement of education in rural areas helps boys and girls, who benefit by gaining a better understanding of the world in which they live and how they can function in it. Finally, numerous positive experiences in the fields of microfinance, agricultural services, professional organizations, property regulations, etc. can be applied to ensure a secure economic environment for productive activities. These elements, previously analyzed in 2008, can serve as the basis for appropriate and acceptable rural development. They should continue to be studied in greater detail, enhanced, reproduced by adapting them to local conditions and put into perspective within the framework of sustainable public policies. 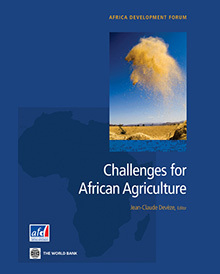 Among the topics to be discussed as a follow up to this book, we recommend that of the place of agriculture in local, national, and regional development, reiterating our conviction that relegating this sector to secondary status leads not only to food, economic, and social crises, but also to cultural and political difficulties. The type of agriculture to be promoted and the possibilities for the coexistence of various models also need to be discussed. One insight that needs to be examined is the impossibility of making agriculture and rural issues priorities in national and regional policies without promoting leaders from the rural environment who are prepared to stand together to ensure that it is taken into consideration; of particular note in this regard is the slowness with which professional agricultural managers emerge and devote themselves to those they serve. It is unfortunate that the book did not spark the discussions expected when it appeared. Not provocative enough? Not relevant enough? Not distributed widely enough? It called for a different take on African agriculture and a united commitment from those who aim to promote it. We hope that the warnings about the possibilities of our common home collapsing will lead to greater awareness of the challenges facing agriculture in Africa and to working on the possibilities of change in order to create a new rural civilization.